Once finished with ‘pope month’ on the course, we had ‘Normans fortnight’, and I used the opportunity to read Robin Fleming’s Kings and Lords in Conquest England, which I’d wanted to do for, er, well more or less since I first read any of her work as an undergraduate I think, so quite a long time, in none of which time had it ever been quite relevant enough.1 But now I have. Three things only bug me about the arguments here, and these are three carps in a whole pool of beautiful goldfish, if you see what I mean. You know by now that this is my way of showing I really read the thing, to try and argue with details, right? So. The first thing is, a point she makes several times but which is easily lost sight of, that we are dealing here only with lay land, which is between a third and two-thirds of all land in England perhaps. 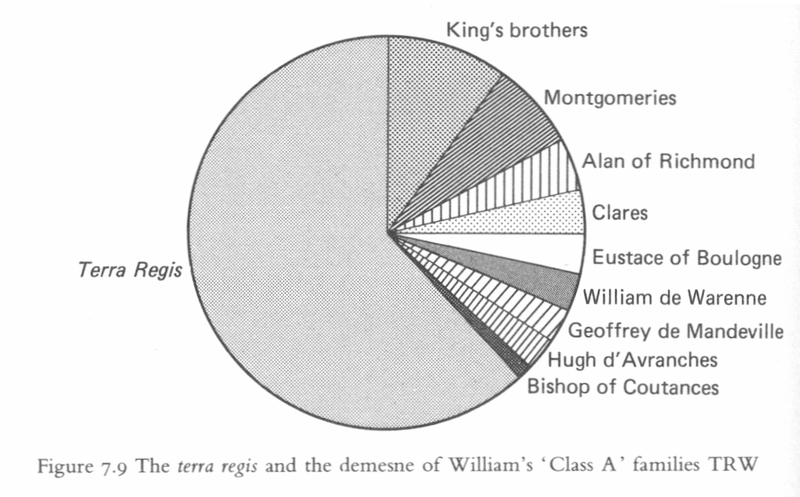 So although if you’re studying the lay aristocracy we have indeed got 100% of their known assets under consideration, if you were interested in the peasantry then we’re looking at rather less. The second thing is another that she admits but I don’t think she really allows the reader time to see how it might affect the argument: Domesday does not record Anglo-Saxon subtenancies in as much detail as it does Anglo-Norman ones, so the fact that tempus regis willelmi land tenure appears to be split between many people and tempus regis eadwardi rather fewer may not all be the fact that Harold of Wessex and brothers and Leofric of Mercia had most of the country sewn up between them, undeniable though that probably is, but partly that we are not seeing the people over who they were lords. 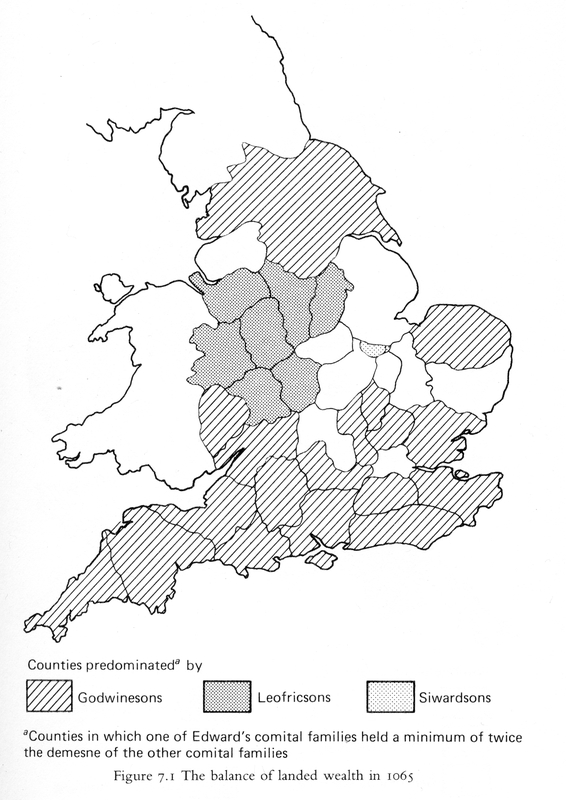 That said, it could be argued against that since Domesday is mainly interested in tenants-in-chief, this doesn’t really affect the upper level and might even militate towards better representation of Anglo-Saxon tenancies whose nature didn’t match the categories that Domesday‘s surveyors were working with. So maybe that doesn’t matter. The question that really seemed uncovered to me is one that I kept asking, especially during the penultimate chapter which tries to document how much of the new lords’ landholdings were simply stolen or extorted. This is a really interesting chapter, and contains fascinating hints of collusion. What happens, I wanted to ask, having had this conversation with Matthew Innes several times in the past,4 when land changes hands? Do we really envisage the people who had owned it packing up their bags and leaving? Was England, or indeed Europe always full of migrants of purchase like this? Well, sometimes perhaps, especially in my area where they sometimes come to the frontier and start a new life, but more often surely they stay put, they just don’t own the land any more. What is happening with some of these cases is surely primarily a change of revenue flow; someone new gets to take the renders and the people working the land stay the same. A lot of the people we’re dealing with here likely weren’t working the land before, of course, and they may now have to. But all the same I think there is not only a great difference between physically expelling people from their lands and simply taking possession, in terms of title, tax and rights, of it while they stay in place with lessened status. I also think that envisaging the latter rather than the former makes it a lot easier to imagine how this whole process could be carried out without the whole of England essentially becoming wasteland and all the English fugitives. 1. Robin Fleming, Kings and Lords in Conquest England, Cambridge Studies in Medieval Life and Thought 4th Series 15 (Cambridge 1991). 2. In this I think she, as with very many other people in fact, owes a lot to the similar perspective of Pauline Stafford, Unification and Conquest: a political and social history of England in the tenth and eleventh centuries (London 1978) and I don’t know if this is one of those I-internalised-it-so-good-I-forgot-it-wasn’t-mine things I described the other day but I find it very weird that that book isn’t cited or in this one’s bibliography. 3. 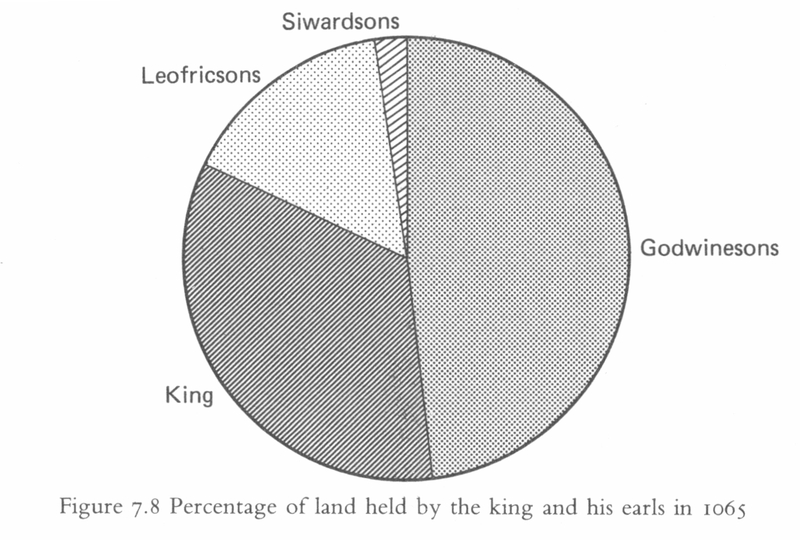 It ought to be noted, however, that Fleming’s figures above differ quite a lot from the results that Mark Lawson got doing the same sums, or at least attempting to: see his “Edward the Confessor’s England” in James Campbell, Patrick Wormald & Eric John (edd. ), The Anglo-Saxons (Harmondsworth 1982), pp. 226-227 at p. 226. 4. You can find Matthew discussing the like in his “Land, Freedom and the Making of the Early Medieval West” in Transactions of the Royal Historical Society 6th Series Vol. 16 (Cambridge 2006), pp. 39-73. Right, this blog is about to go on holiday hiatus, but given as I’m writing in real-time for once, I ought to give some news too. Firstly, I hate it when this happens, but since I advertised it here I now have to unadvertise it: an article I have been touting as forthcoming, my “Arabic-named communities in ninth- and tenth-century Asturias and León, at court and at home” in Journal of Medieval Iberian Studies (London: Taylor-Francis forthcoming), is now not forthcoming in any foreseeable time-frame. An extra reviewer freshly consulted has ruled against it until it can be heavily rebuilt, and I don’t see that time accruing any time soon. So that’s annoying, though arguably my own fault for submitting shaky work (I now see). I’d like to have been told this before making urgent revisions to meet a mid-2009 publication deadline that didn’t in fact apply, but never mind. It joins both the other things that were called ‘forthcoming 2009’ on job applications as things that did not in fact forthcome yet. Huh. Also, my course evaluations—and congratulations to Queen Mary for being the first place I ever taught at which actually gave me some—were full of, er, opportunities for improvement, which I intend to be taking next term, but dealing with these pieces of news on the same day was still a bit disheartening, and renews my background resolve to come up with a Plan C in case, really, I’m just not good enough at this game to ever win it. On the other hand, what with the Rosamundfestkonferenz, I now have another article in pre-publication limbo, so my actual potential remains about the same, and meanwhile I have had my first interview for quite some time, so presumably I am in some sense doing something academic right, albeit very slowly. I shall take that thought away with me along with a few books and some hold-over presents—that interview came as rather a surprise and during a period in which Cambridge has been ice-bound and travel rather more tedious than usual—and return to you on the 28th inst. Until then the blog will be running on automatic: I shall stick a post up on the 27th, because I have stuff queued up I want to get unqueued, but I shan’t be here to moderate comments or answer things till after that. I hope you all have excellent holidays and that your families are pleasant where you are with them! I should not always write off journalists’ history. Only sometimes. I am establishing a bit of a pedigree here for complaining about journalists writing about history without knowing what they’re on about, so it behoves me to recognise when the opposite happens and something genuinely good appears in the paper. After all, one thread of the discussion down a bit about how pseudo-scholarship gets disseminated is incriminating the media working from out-of-date half-remembered university courses (and probably Wikipedia entries written by people doing the same), and I think they do have a power to inform over and above that which we have and which we need to try and inform in turn, or where that’s not possible, embarrass. But this is a good one. A few weeks ago, the Guardian, a British left-leaning newspaper that likes to include small booklets on unnewsable themes like 20th-century poets, cycle maintenance, geographical statistics and so on, did a pair on Kings and Queens of Britain. I only saw the first one, but it was lots of fun. The guilty party is one Helen Castor, whose pedigree has “medievalist” stamped all over it and so it’s not surprising to find that I probably walk past her every few weeks, for she is an academic writing for the papers (and this is good) and has been in Cambridge nearly as long as I have and rather more successfully. Anyway, she should take a bow as not only was this booklet chock-full of memorable factoids and soundbites, but they were all but one at least sustainable while still being interesting. She covered from Athelstan, justifying that choice in good historical terms, to Richard III, but she also explained Athelstan with a box on Alfred the Great, and that included the story of the cakes. The mistake, and as I say the only one I noticed, was that she ascribed the story to Asser not William of Malmesbury, which obviously affects how people who can compare years will read it. So that’s an annoyance but it was possible for her to make that mistake because she mentioned Asser, with his approximate dates, and explained who he was and so on. Now, when do you suppose was the last time anyone read about Asser in a newspaper? So on the whole I am full of praise for this endeavour, which shows not only that it can be done, but that it can be done concisely and accurately without losing punch, interest or, importantly, humour. 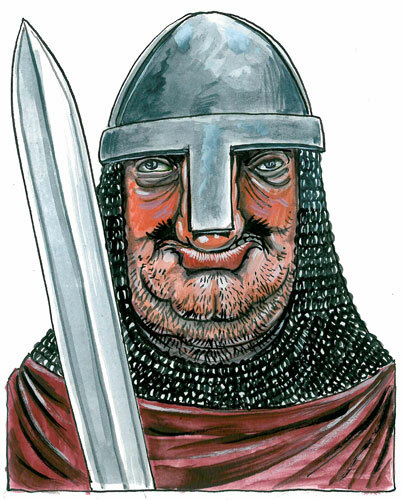 I’m not so sure about Martin Rowson, the cartoonist’s depiction, of the Anglo-Norman kings, who were surely not piggy and fat as he has them. But that’s a small price to pay for the effect of pulling people in with the drawings. It shows Horrible Histories a clean pair of heels, anyway. The seat was created by master furniture maker Adrian McCurdy who drew inspiration from stone carvings. And the actual NMoS press page is a lot more circumspect, so I might blame the journalists overall. But the key word there is inspiration, because we’re talking about a very few carvings. I can’t immediately find out which stones have such a depiction on it but firstly, and most obviously, from a stone carving you can only guess what material the original object was in: it might have been stone! Secondly, but not much less important, we only have guesses as to what the Pictish stones actually depict in their mise-en-scènes; whatever source Mr McCurdy used may have been depicting, for example, an Old Testament king of Israel, for all we know, or a contemporary king depicted as one, and so on. So there’s really no foundation for this beyond “we made something a bit like what’s on the stone”. I wonder whose spin it is that makes it more here. "And I suppose now you're queen, is that it?" Seminary LVI: what use a Carolingian chronicle? Before I disappeared once more into unseminary occlusion, I made it to one at least of the Institute of Historical Research’s Earlier Middle Ages Seminars, not least because the speaker was Dr Simon MacLean of the University of St Andrews, long-time acquaintance of yer humble blogger and someone who will expect to see his paper mentioned here… Also, because of the subject, though mainly because I didn’t have to write a lecture for the next week. The subject was, “Recycling the Franks in 12th-Century England: Regino of Prum and the Monks of Durham”, and since Simon has been raising interest in Regino for some time, to the extent of recently translating his Chronicon into English, I wanted to hear what he was going to say. As the title suggests, the paper was more about twelfth-century Durham than anything Regino would have recognised, and needed a lot of setting up in terms of the contemporary politics, which were, on the grand scale (and usefully, since I’d been reading up on it for teaching at the time) the Investiture Contest and the aftermath of the marytrdom of Thomas à Becket. 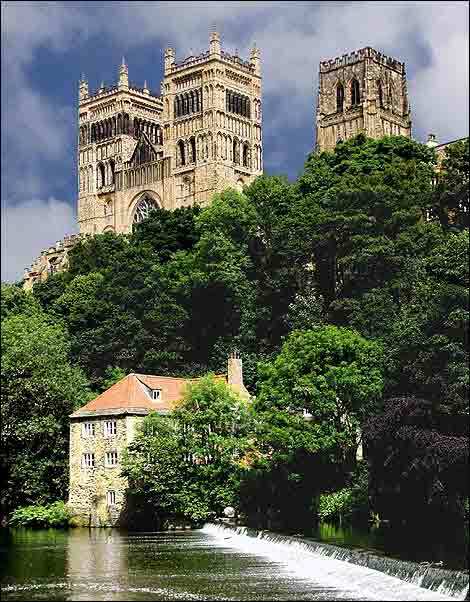 Durham, facing Scotland as it did and endowed with plenipotentiary powers which led its incumbent to be called the Prince-Bishop and the associated county a palatinate one, was a see over which royal control was very tight and the incumbent was frequently absent. It was also very often in dispute with its own cathedral chapter, and the special place of the bishop in the kingdom made it easy for the monks of the cathedral to obtain papal judgements against him when they came into dispute. 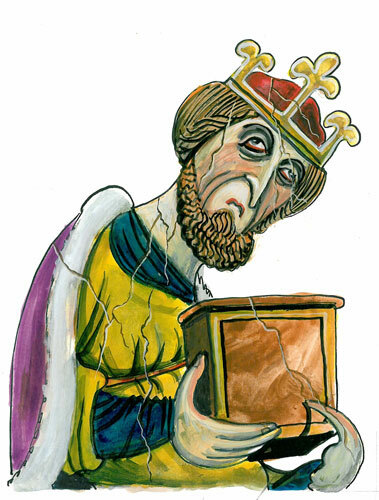 Since Henry II was for a large part of his reign in breach with Rome, it is not a small thing that the monks of one his major sees were regularly going there to get judgements against their own bishop, and it shows you how the big agendas were pulled on by and pulled in smaller disputes and polarised them (as with family, chariot racing factions, Christianity at the adoption stage, and many other grand themes). Somewhere in all this the monks amassed a historical compilation, apparently put together out of several lesser parchment pamphlets, themselves all compiled for separate purposes. The result now survives in one lump as Cambridge, Corpus Christi College, MS 139, which of course means that it’s online if you’re in the right places, but Simon was interested in the first pamphlet component, which contains a load of Durham-centric texts and an abstract of Regino’s Chronicon. This looks extremely out of place among its insular companion pieces, but Simon argued, with painstaking analysis lying behind his argument, that it had been selected carefully to make a point, and one of the reasons that we can believe this is that the manuscript of Regino that was being used is still at Durham where you can, apparently see that the text is marked up for excerpting in just the places it was done in CCCC 139. (Not sure if I have this right: the MGH suggests that the antecessor of CCCC 139 is (now) British Library MS Arundel 390 and mentions no Durham MS, but I think that’s what Simon said. The Durham MS collections are not catalogued online yet, sadly.) Regino’s original purpose was, says Simon and I don’t doubt him, to write a dynastic history of the Carolingians charting their rise and fall, but he was also very interested in their relations with Rome, and indeed saw that as crucial to the explanation of that rise and fall. (He is, for example, one of the best sources we have on Nicholas I, who as I keep telling you keeps coming up. Simon made this point without my having to question him, too, and I hadn’t stuck any of my rants about the neglect of the man up here yet.) The monks of Durham didn’t really care too much about the Carolingians, but they certainly cared about kings being deferential to popes, and that’s what they went through this text for, there being plenty to find. They included other things too, and what the agenda was there other than interest Simon admitted he could not yet tell, but where there was something that made that point it was included, and where there was something that went against that particular grain, it was not. All seemed plausible enough to me. That’s what Carolingian history was good for to some twelfth-century English monks, it would seem. I accept all this, but I would still like to know—not that I know how we find out—more about the audience of the manuscript. Simon said that within a few years of its compilation and binding it seems to have been passed on to the new Cistercian foundation of Sawley Abbey, whose ex libris is visible under UV. 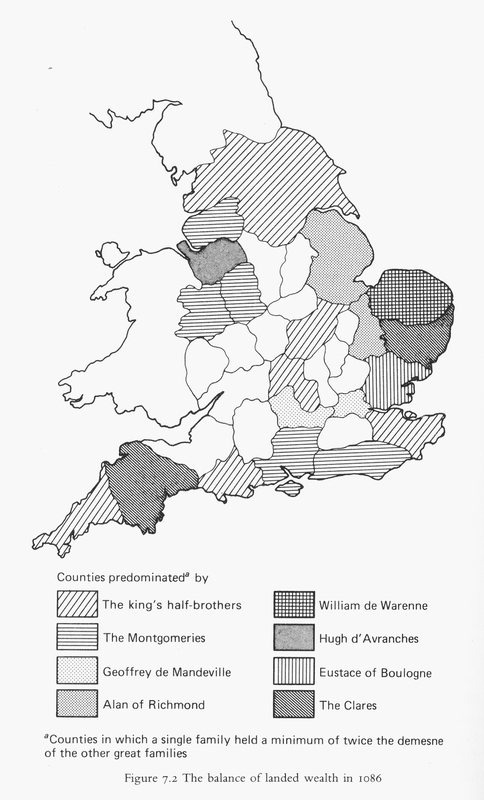 Why that might be was hard to understand, given it was so Durham-centric in contents, and Sawley’s a long way from Durham, but Simon said that it did seem to have been connected to the contemporary Bishop Hugh de Puiset. That, to me at least, raised the intriguing (and unverifiable) possibility that the audience, in the end, had been the bishop, for whom many of the texts in the book could have been seen as exempla, and he hadn’t liked it, and had decided to piously get rid of it as far from his rebellious monks as he could easily manage… I like it as a theory, anyway! Completely off-topic! One day a little while back when I was feeling unsually despondent, I also happened across what appears to be a completely false report that Cambridge University Library is seeking commercial sponsorship, now removed from the Guardian‘s website. This reminded me of something I’d been meaning to do for ages, ever since the UL’s car-park re-emerged from the mysterious building works that had shrouded it for several months. When it had re-emerged, it had done so with a new cycle lane across the front of the building, and a pillar system keeping the cars back from it. The pillars are really cool. It wasn’t until I read a story in the local newspaper that I realised this was not just a bright idea from inside the UL, but a ‘new public artwork’. There are fourteen of the pillars and the central four, which bear the title (“Ex Libris”), rotate, so that you can line them all up and read it. This academic year I have been teaching on Tuesdays, when the Cambridge Late Antique, Byzantine and Early Medieval Seminar runs, looking after a child Tuesday evenings when the London Society for Medieval Studies meets, and writing lectures for the next Tuesday on Wednesdays, when the Institute of Historical Research Earlier Middle Ages seminar is held. And then during London’s reading week I was laid out with a stomach complaint. So I hadn’t been to any seminars at all this term until 16 November, a Monday, when Arietta Papaconstantinou of the University of Oxford spoke to the Cambridge Byzantine Seminar to the title, ‘Identifying Rural Elites in Egypt and Southern Palestine from Justinian to the Umayyads’. I was late, because it starts at five and I have, you know, a job, but I was there, so, a report. With those reservations, her approximate picture was of considerable local continuity. Where the Umayyads took over, which was everywhere in her zone, as far as we can tell local élites remained largely unaffected, still using Greek titles (even where they spoke Coptic or Syriac) and referring to `imperial’ law long after the Greek emperors had lost any relevance. Rich get richer, poor get poorer, but I think that there’s no documentary corpus where we don’t by definition see accumulation over time, so I don’t know that that isn’t a constant; it certainly always seems to be going on. It’s only in the late eighth century that Islam begins to make itself evident in terms of personal names and new offices; until then all that happens is that the local élites report to new governors. However, against that she also spoke of a change towards involvement in the Church, because the secular promotion prospects that would once have carried those local élites out to wider influence were now closed down, as was military service. So the Church actually does better for a while because of the Islamic takeover, because it becomes the area of competition for Christian status that’s still open. Most of this stuff, which interested me most, came out in questions: it seems in retrospect as if most of the actual paper was spent just laying the ground for the questions by explaining the milieu and the difficulties of the evidence. One thing that did come up again and again however was the difficulty of defining rural and urban. Dr Papaconstantinou’s main contention was that wealth and trade in the towns of her zone becomes primarily agricultural, with industry basically focussing on processing agricultural produce, rather than manufacturing ceramics or metalwork, for example. Does that stop these towns being urban? Some villages retain an administrative function even though they’re far smaller than others that become trading places but have none. The whole situation is full of edge cases. Central settlements remain foci of the community, but wealth becomes basically agricultural. I see the problem of definition here, of course, but the idea of there being towns or villages that work like that, that are places where people come for any reason other than worship, come to by default as part of their social involvement, is right off my area’s map, where you go to the city to go to court and otherwise only if you’re rich and have lots to sell. Peter Sarris compared fifth-century Gaul as a model where Church towns take over from a rurally-funded urban secular élite but this zone seemed to be functioning on a much smaller scale to me; there are only a few big cities in this area (Fustat, Jerusalem, Alexandria) and lots of small towns or big villages. So I suppose this was one of those unusual Byzantine seminars where it was the area rather than scholarship that seemed alien, whereas it is too often the other way round, where one feels that one would recognise much of this but for the scholarly language of the field. Dr Papaconstantinou therefore ought to be encouraged to keep explaining this stuff outside her field as I learnt a lot quite easily from this seminar. I have no idea how new it was to the experts, but it was new to me which is what I was after.